Autorefractor is a computer controlled device used to objectively measure the refraction ( glass or contact lens prescription ). It is an adjunct to a good retinoscopy. A high intensity light in conjunction with a microscope facilitates the binocular examination of the eye. A magnified, stereoscopic view of the eye structures which include the eyelid, sclera and conjunctiva ( white part ), cornea ( transparent window in the front of the eye ), iris ( coloured part ) and the natural lens. Combined with special lenses, Zeiss 4-mirror for angle structures and +90D for retinal evaluation is possible. Ophthalmoscopy is performed as a part of a complete eye examination. It is used to detect disorders of the disc and retina ( macula, mid-periphery, ora) Retinal detachments, Macular disorders, Vascular disorders ( eg. Diabetes, Hypertension ) are visualized. Tonometry is the procedure to determine intraocular pressure ( IOP ) which is the fluid pressure in the eye. Goldmann tonometry is the gold standard and is the most widely accepted method of determining IOP. 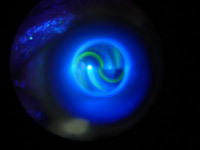 Fundus Fluorescein Angiography (FFA) is an diagnostic procedure to identify and demarcate abnormal areas in the retina. A dye is injected into a forearm vein and it starts to circulate in the bloodstream. Then serial photographs of the retina are taken. FFA aids in planning out the best treatment options for the underlying disorder or disease of the retina.
" OCT is non-invasive,non-contact imaging technology that can show retinal and optic nerve head structures with a resolution of 10 microns. It can differentiate the layers of the retina and measure thickness of the tissue also. Diabetic Retinopathy, Macular diseases and conditions involving the optic nerve head can all be identified. " The area in space that can be seen by the eye is known as the visual field. Plotting the visual field is important for disorders of the optic nerve ( including GLAUCOMA ), stroke and certain brain tumours. Both subtle and gross peripheral vision deficits can be systematically plotted and detected by the sophisticated methodology of a computerised visual field analyser. It still remains a gold standard to evaluate patients with suspected or actual glaucoma. Contact A-scan biometry is used to calculate the axial length of the eyeball. This is used in calculating the IOL power during pre-operative assessment for surgery ( PHACOEMULSIFICATION, PRELEX, BIOPTICS ). IOL Master is an optical coherence biometer that can accurately measure axial length and surface curvature of the eye. And it does so without touching the eye. B-scan ultrasonography uses sound waves transmitted through a probe onto the eye. It is most useful when direct visualization of structures within the eyeball is impossible. Severe lid swelling, corneal scarring, blood or pus inside the eye, dense cataracts or membranes, vitreous bleeding or inflammatory debris all hamper are a few causes. It is also very useful in diagnosing purposes even though the pathology is clinically visible. eg.tumours, detachments ( retinal and choroidal ), optic disc swelling.